This small woodpecker prefers burned out, logged or swampy coniferous forests, mainly across Canada's boreal region. With a black back and wings, barred flanks and white underparts, it is most easily identified by its yellow crown and white cheek markings. As a retired ornithologist and former museum director, I would like to toss a little history into the discussion. The Society of Canadian Ornithologists (SCO) about 20 or so years ago asked themselves the same question. What bird species should be the symbol of our Canadian ornithological organization? We settled on the Black-backed Woodpecker (Picoides arcticus) even to the extent of calling our magazine (Picoides). Why did we pick it? Two reasons I recall, one was clearly distribution - it can be found almost anywhere boreal forests occur throughout the country and yet its distribution in the United States is modest. Secondly, it doesn't pack up and fly out of the country when winter hits, it is a true Canadian resident. Now if history is our guide, we should also consider the birds picked for the cover of Earl Godfrey's work - Birds of Canada - first published in 1966. I don't know what process was used at the time but the first edition had an Arctic Tern on the cover and the next edition a Whooping Crane. Both of these only spend the breeding season in Canada so perhaps they were just good photos. Our currency has featured birds - Robins, Snowy Owls, Canada Geese, and of course Common Loons. Presumably officials agonized over each choice. The Loonie has stuck though and there is something quintessentially Canadian about the haunting call of a Common Loon even if the species can be found elsewhere. I have no real quibble with Gray Jay - they can breed in late winter which is astonishing but somehow Canadian. I feel their comfort with humans is a problem if there is a plan for our collective choice to be an educational tool. That's why given a choice I would opt for the Black-backed Woodpecker - it can be used as a symbol of changing forests and forest distributions whatever the cause. However, in favour of Gray Jays, people are more likely to encounter one on a casual visit to the forest, the woodpecker is harder to see. Whatever species we pick, we will not change the Beaver as our national "animal" symbol and it will continue to be compared to and fall short of the Bald Eagle as a symbol. We can't be concerned about that - we don't need a raptor to compete with the eagle. Having been involved in the selection of a number of official Alberta symbols, it is ultimately a popularity contest but the characteristics I would look for are: it is a resident, predominantly distributed in and widespread in Canada, it can help us understand issues our Canadian natural environment faces, and it is a species Canadians (who are not birders) are likely to encounter and identify. Okay, maybe on the last point the Black-backed Woodpecker falls a bit short but I still like it - sorry Gray Jay. The Black-backed woodpecker should definitely get voted because it is an unique, fascinating bird that represents Canada. This woodpecker lives year round in almost all the areas in Canada (barely lives in the U.S), has special characteristics and will convince Canadians to protect more of it's habitat because it has specific habitat preferences. Some of the birds that are being voted, also live in most of the U.S or live in more foreign countries rather than Canada.The bird that gets voted should live in most of Canada or in Canada only because this means that it is more hardy and able to withstand most of Canada's weather, just like how we Canadians have to. This also means that we can enjoy more of the bird's presence because it lives mostly only in Canada. The Black-backed woodpecker is a more secretive bird, and although it is not the most vivid and flamboyant bird out there, it represents Canada's and its citizens more secretive and not so vivid personality. For example, Canada isn't exactly a warm,tropical place or is a place full of tropical, vibrant bird species. Therefore it should be a more secretive and less vibrant bird, but it is also friendly(like us Canadians and our country) just like the Black-backed woodpecker. This woodpecker also lives in northern boreal and montane coniferous forests and because this habitat is disappearing, we need to protect this habitat to keep the population from decreasing. If it becomes Canada's national bird, this will make us want to protect it's habitat, so not only can the Black-backed woodpecker be able to thrive, but so will all the other plants and animals be able to if this habitat is protected. This shows that Canada is a beautiful and stunning country, but it needs protection and help if the beauty of Canada and all the plants and animals living inside it are going to stay. Also, only birds that aren't already one of Canada's provincial birds should be able to become Canada's national bird. If a bird represents one of Canada's provinces and this country, that would be too much fame for just one bird. There should be more of a variety of birds that get picked to represent something, to let other birds also have the opportunity. Every bird has something different about it that represents Canada, such as what type of habitat it lives in or it's type of personality. The more variety, the more characteristics and facts can be added to represent Canada. The Black-backed woodpecker isn't already one of Canada's provincial birds, so it should become Canada's national bird. Even though it is tough to find and rather secretive, that shouldn't let this interesting bird not get picked. Other countries also have national birds that are more secretive and not that well known, so that shouldn't stop you from voting it just because it is more "unpopular" or not as "well known" as others species. The Black-backed woodpecker is a fascinating species that represents Canada really well and is very different from any other bird. Vote for the Black-backed woodpecker and help make a big difference in Canada! Birds are of such value and their numbers are in so many cases dwindling, that for different places to use the same official bird is a disservice to all the other birds who need out attention. The Black-backed Woodpecker is one of the truly distinctive Canadian birds. It has a very distinctive call, and resides in Canada all year long. Though a rare occurrence in Nunavut, it is at the very edge of the regular range, and will be seen there more frequently as global warming occurs and forested ranges shift. So Nunavut would be at the forefront of the northern advance of this beautiful woodpecker. This bird thrives on dead trees, whether from insect kills or fires, and as global warming burns more of our forests, it is quite possible we'll be seeing more of these black woodpeckers. It will also be important for us to manage these dead forests properly so as to not completely eliminate their habitat. The Black-backed Woodpecker is a bird of great interest which merits more study and truly deserves our protection and caring. and beautiful. It never fails to uplift one's spirits . Summer winter this bird is a true Canadian. Le pic à dos noir est un bel oiseau qui met de l'ambiance dans nos forêts et sans lequel une promenade sylvestre serait beaucoup plus terne, sans compter les services qu'il nous rend au niveau du contrôle des incectes. Il est représenté d'un océan à l'autre et vit parmi nous à l'année. Canadas national bird should represent Canada. The black backed woodpecker's range is almost entirely limited to Canada, only a bit of its range reaches to Alaska and northern America. It looks nice but modest, like canadians. It's also not too bright and flamboyant like tropical region people. It's shy but friendly like canadians, and although it's difficult to find, it's rewarding when spotted. It lives in deep to open coniferous forest and mountainous to flat regions. It looks and practically feels Canadian. I can see this bird on the back of a coin or on the prime ministers suit jacket. Uncommon but special and not well known, this bird is the obvious choice. This bird represents the clean, natural, and wild beauty Canada is known for. The Black-backed woodpecker is always busy and hardworking. That is the definition of Canadians. We are always trying to do our best, hardest work. they life in conifer trees and well they are super common around here. Cet oiseau magnifique se retrouve partout au Canada! 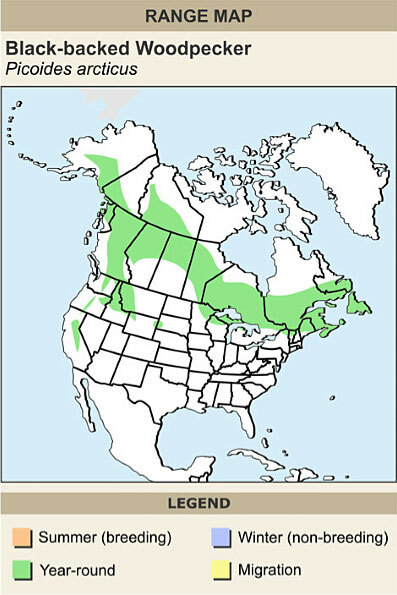 As is evident in the following range map, the Black-backed Woodpecker is the most Canadian of birds. It is present in all of our provinces and territories, and yet has very little presence outside of Canada. Quebec already has the Snowy Owl as its official bird, so I think that eliminates this bird. The top contender, the Common Loon, has a much wider range than Canada, and its population is very stable. We are already very well acquainted with the Common Loon. 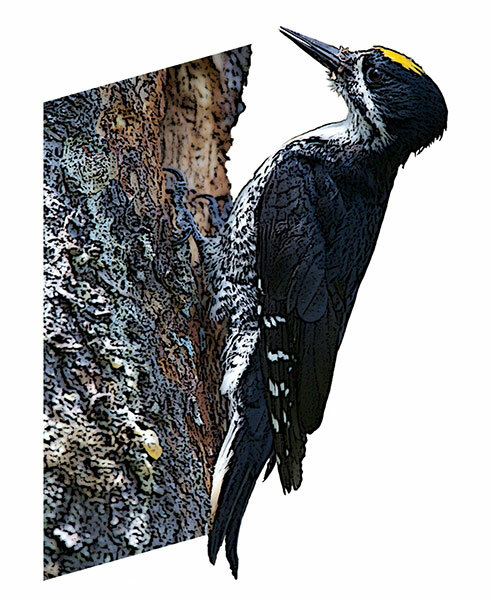 I feel that Canada's official bird should also be of conservation interest and the Black-backed Woodpecker follows forest fires and munches on wood-boring beetles in recently burned habitats, how cool is that ! There are prettier birds, there are better known birds, there are birds with all sorts of ranges, but I feel the Black-backed Woodpecker is the ultimate Canada bird. When you look at the range map you can see that the black-backed woodpecker is mainly in Canada, year round. This quiet, industrious bird would be a great representative for Canada!